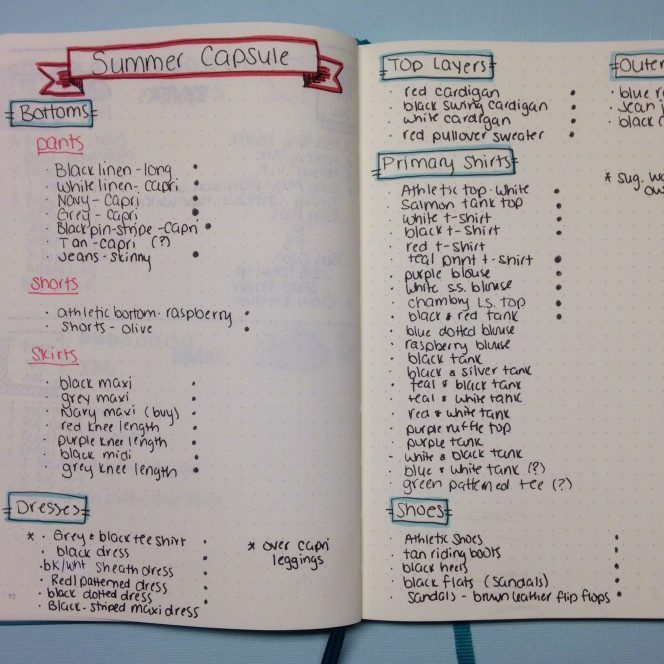 The real value in using your Bullet Journal to keep track of your capsule wardrobe comes when you have reached the end of a season. When I set up my summer capsule this past week, I made a note of each piece I chose in my Bullet Journal. I separated the pieces by the category name Cladwell assigns them, with subcategories in the bottoms category. I used a grey dot to signify if the piece was part of my original Cladwell recommendation for my Summer Capsule. 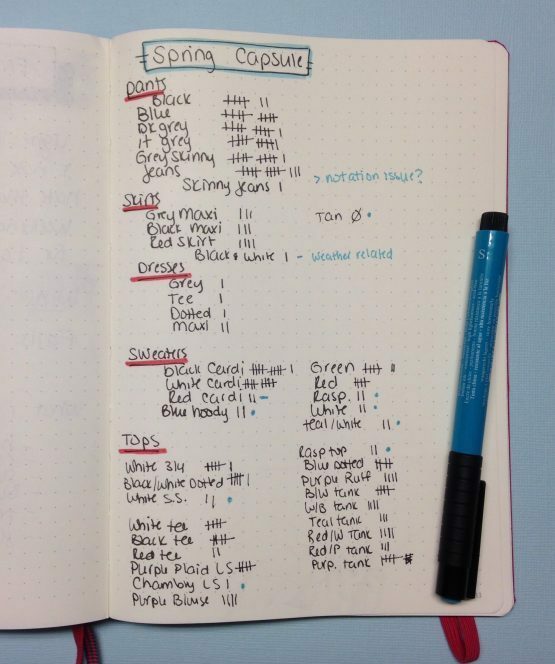 This is a much neater version of my spring capsule layout, which was crammed all on one page, and in which I used a yellow marker to highlight the recommended pieces. It was a bit of a mess, as I was in a rush. In the spirit of full disclosure, I should tell you that I made some substitutions. My capsule originally contained 3 athletic tops and 2 athletic bottoms. I left in one athletic top and bottom, and switched out the second bottom for a pair of olive linen shorts I have. I like to wear those to go hiking, kayaking, to mow the lawn, to go on long car trips, you name it. They are soft, comfortable, and the length is good. I switched out one of the athletic tops for a printed teal tee that I love, and the other for a printed salmon color cotton tank that I wear all summer long. It usually gets paired with my olive shorts, or my short grey skirt, but it’s my casual summer tank. Cladwell also recommended two pairs of shorts which I substituted for skirts. Because I work in an office, and there is less opportunity for mix-and-match with this season’s pieces, I kept all the dressier tanks that were in my spring capsule. I find these pieces to be versatile year round, as I can throw a cardigan over them when the weather is cooler. I have a few pieces I was on the fence about, and they have a question mark next to them. When I review this capsule in the fall, I will take note of how often they were worn and decide if I keep them or not. 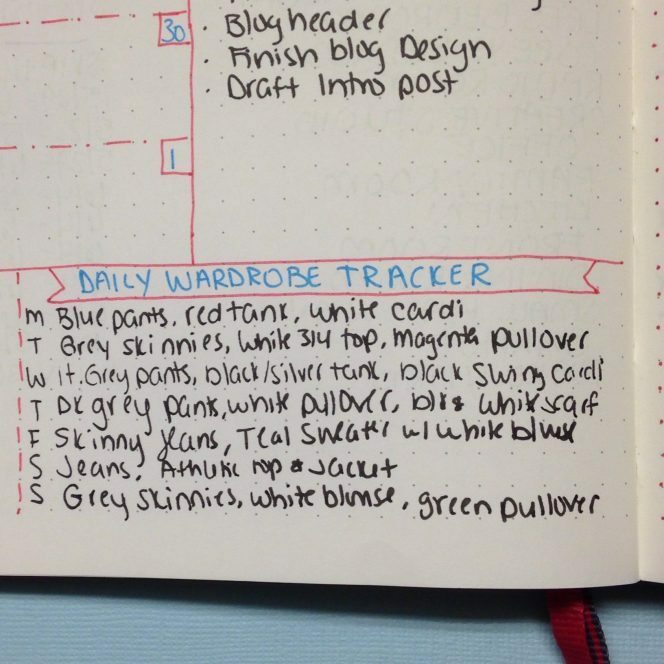 One of the elements of my weekly layout is a section that is now just called “wardrobe tracker”. This was from back in the spring when I first started using it. 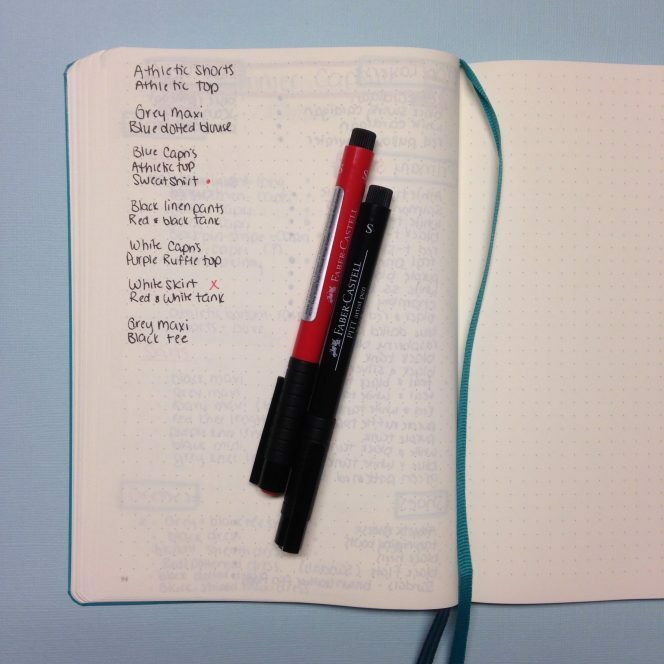 It’s basically just a spot for me to write down what I wear each day. Not very exciting you’re thinking. Before I began using tags to indicate “worn once” on my pants, this helped me to see when I had worn my pants twice and they needed to go into the wash.
Once a week or so, I transfer that information into a collection that comes right after the capsule information. This is the start of my summer collection. Over the next three months (it stays fairly warm here through September) I will note what outfits I wore on these pages. If an outfit combination gets worn more than once, I put a checkmark next to the original notation. 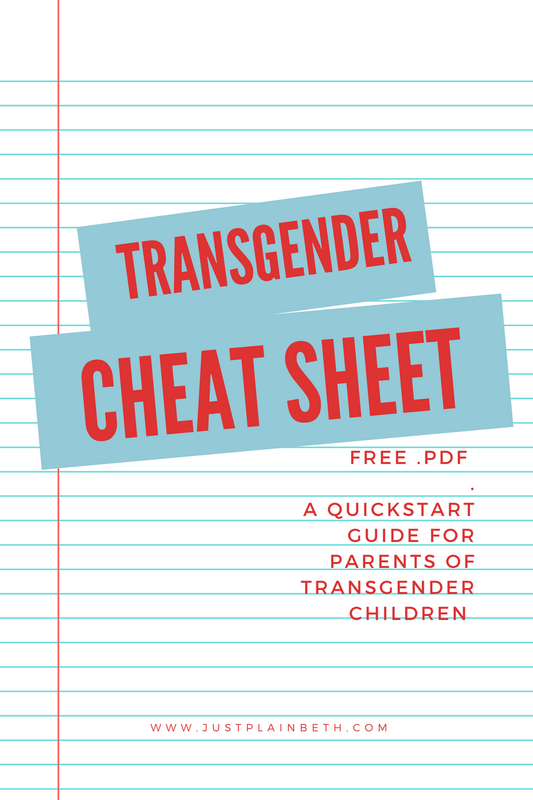 I make two columns of information on each page, yet I learned from my spring capsule that I need to set aside four pages for this. I ran out of space using only two and had to cram outfits into the space between the columns. You can see that I already put a red x next to an item on this list. It was an outfit I wore as I was still sorting out my capsule, and I decided that particular skirt wasn’t staying in my wardrobe and added it to my donation pile. The red dot next to the sweatshirt is because I should have included a sweatshirt in my capsule, and did not. At the end of the season, I tabulate all the information and have a look at what items were most worn, and which ones didn’t get that much use. I know that my skinny jeans got worn more than once, and I think what happened was I just wrote “jeans” in my tracker. I need to be better about that. My red cardigan and red tee have low use because they entered my capsule in May. My blue hooded sweater is something I added then didn’t wear much. I kept it, because I think it may get more use in the fall. If I get back to spring and it hasn’t gotten much more use, it will get donated. My tan skirt is wool, and I think that was more of a fall/winter item. I thought of a lot more ways I could have worn my black/white skirt, which is also wool, after the fact. I think that sometimes it’s hard to get motivated to wear a skirt when it’s cold, which is why my maxi skirts got more wear as they are longer. I wore all of my pants fairly often, minus the tan ones, which didn’t even make it on the list as they had no notations in my book. The items with a blue dot next to them are on my “maybe donate” list. Although. my white short sleeve blouse is on rotation this summer as a top layer, so we will see how that goes. It’s easy to fall into the trap of thinking “I wear the same thing all the time”, but when I went through and looked at my wardrobe tracker, and tabulated out my outfits, I found that not to be the case at all. I found I had plenty of variety, and maybe too much still. 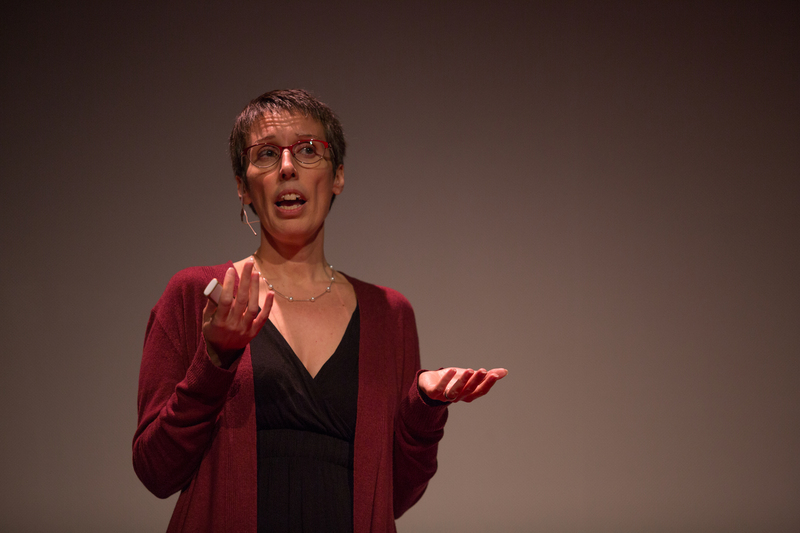 What I like about the capsule wardrobe is that it can continually evolve as you need it to.